As I brought up in a previous post, there are very few existing early recordings of music from the islands in the Atlantic Ocean that have a history with Portugal or the Portuguese Empire: the Azores, Madeira, and Cape Verde. Maderia and the Azores are present-day autonomous regions of Portugal. No 78 rpm recordings of true Madeiran music were made. 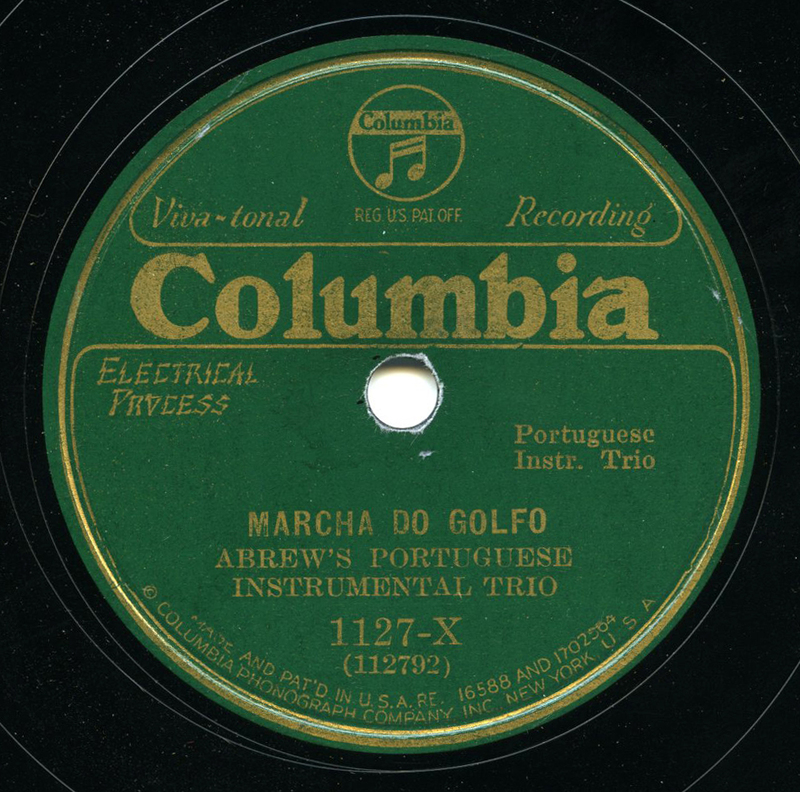 As for the Azores, the raw performances made by the Sears family in California on their own label appear to be some of the earliest existing recordings of Azorean folk music. Interestingly, the music of Cape Verde, a former colony, fared slightly better – but not much. Cape Verde is geographically, historically, and at times throughout its history, politically connected with Africa. Once uninhabited, isolated islands, the forces behind the Portuguese Empire turned Cape Verde into a thriving pit stop for the Atlantic Ocean slave trade, as well as for trade in general. From the 15th century on, the transaction of thousands of West African slaves for goods from Europe occurred on Cape Verde. Though the practice continued until the late 1800s, it weakened as the islands instead became an important port and fuel re-supply station for transatlantic vessels. I briefly mention these points because Cape Verde, due to its geographical position and troubling history under colonialism, has a uniquely African-European, mixed “crioulo” population. It also has a large diaspora. A substantial amount of Cape Verdean immigrants also ended up in New England, much like immigrants from the Azores. Like most, they carried their music with them. While many today associate Cape Verdean music with the incomparable and elegant Cesaria Evora, there is also strong string band tradition as well, featuring waltzes, mazurkas, marches, mornas, and polkas, played by fiddle-led bands. From 1931-1933, two Cape Verdean string bands from New England were brought into Columbia Records’ studios in New York to make a total of 12 records. One band was Johnny Perry’s Portuguese Instrumental Trio (also credited as Johnny Perry’s Capeverdean Serenaders), who made a total of 8 records from early 1932 to late 1933 – a terrible time for the global record industry. The other was Augustus Abreu’s band, credited as Abrew’s Portuguese Instrumental Trio, who cut a lonely 4 discs in February of 1931. These records, featuring Abreu on fiddle, and uncredited musicians on guitars and sometimes cavaquinho, are now very rare, and uniquely present the earliest Cape Verdean music on disc. What’s interesting with this track, however (thanks to reader nahon in the comments, below), is that it appears to be a slightly altered version of the Russian song “Longing for Home” (“Тоска по родине”)! Augustus Freitas Abreu, Sr., was born in 1897 on the Cape Verdean island of Fogo – essentially a large volcano. He immigrated to Massachusetts in 1920, joining his sister Candida and his brother Luiz, already living in the state. Augustus married Edna May Walker sometime before 1930, and they had 7 children. The Abreus moved between several towns in Massachusetts: New Bedford, Wareham, and Harwich on Cape Cod. Eventually, the family moved to California, where Augustus died in 1958. He and his wife, who passed away in 1978, are both buried in Sacramento. As far as I can tell, there was no additional recording of any Cape Verdean music until the 1950s, when Cape Verdean mornas and other tunes likely recorded in Europe were issued on a Portuguese series on the Parlophone label. As nice as they are, the discs that I’ve heard, while led by fiddle, just don’t have the same character and sincerity as these early recordings. Thankfully, three additional Abrew’s tracks have made it to CD. Two are on the out-of-print Portuguese String Music, 1908-1931 CD/LP on Heritage (which also contains a fantastic track by Johnny Perry’s band). One of those same tracks is used on Marshall Wyatt’s in-print Old Hat CD, Folks, He Sure Do Pull Some Bow. A third track is available on Rounder’s Raw Fiddle CD collection. Both that and the Heritage release are curated by Richard Spottswood. For more recent Cape Verdean fiddle music, you could hardly go wrong by checking out the recordings made by the late Travadinha.